The Ranger RL-8500 Combination Brake Lathe is innovative and uses independent DC servo motors. The motors control the cross feed and spindle feed drives, eliminating any complex mechanical gear boxes and transmissions normally found on mechanically-driven lathes. 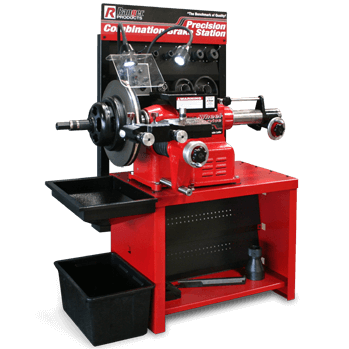 The Ranger RL-8500XLT Combination Brake Lathe is very heavy-duty, has extended capacity and the capability of truing a full 10-inch deep drum brake. 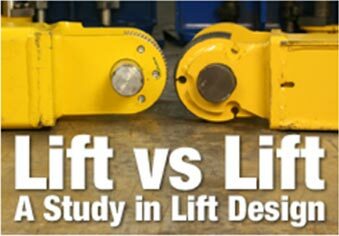 This method eliminates complicated gear boxes and transmissions normally seen on mechanical-driven lathes. Featuring an independent DC servo motor(s) and including extended adapter kit, lathe, bench, and some accessories. Set of 3, light and medium truck adapters to increase brake lathing performance and brake component mounting capacity. Lathe drums and rotors to micro-finished smooth perfection like never before, even on light and medium trucks. Every great shop has a Ranger full-service brake lathe. They are by far the best investment you can make for brake service today because they are known for speed, toughness and precision. They feature, at the turn of dial, infinitely adjustable feed rates. 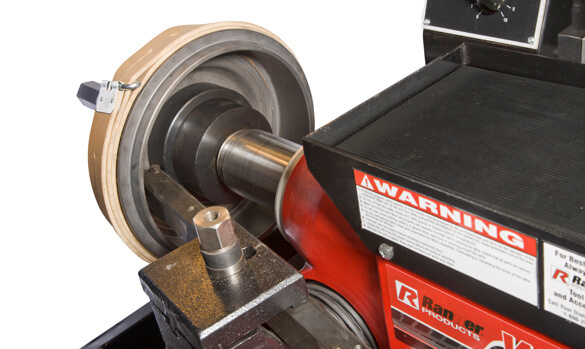 Ranger brake lathes are designed to deliver perfect results every time. Superior choice because no other brake lathe in the same class has these great Ranger innovations! 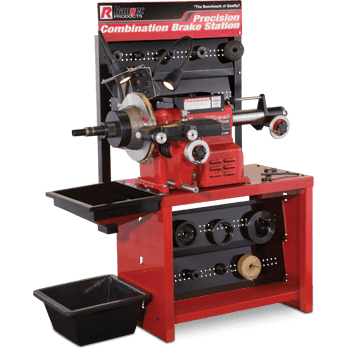 Operational shop equipment is a necessity for any shop large or small, so a Ranger combination brake lathe is perfect for repairing vehicle drive ability, safety, fixing brake pedal pulsation, and removing that annoying brake noise. 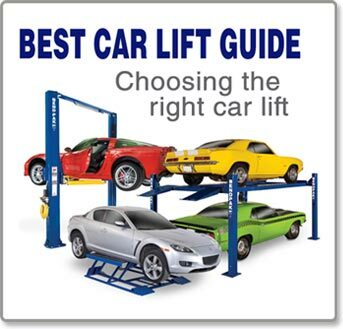 Most complaints customers have regarding their brakes is when the push on the pedal. Uneven surface flaws are responsible for most of these issues. When brake surface variations are found, the rotor's imperfections need to be machined down so that high spots are machined smooth across the entire surface. Brake lathe resurfacing is usually less costly and easier than replacing the rotor. 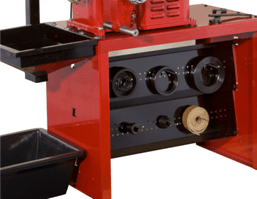 Ranger Brake Lathes are the industry professionals first choice because no other brake lathe on the market has the same incredible technology, it's what every brake service shop or garage is looking for. 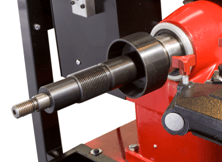 Vibration and chatter transfer are the most common problems that other brake lathes have and it directly affects the tool-tip and can leave imperfect cuts on machined surfaces. The RL-8500 Brake Lathe by Ranger eliminates the need for gear-driven mechanical drives and variable-speed transmission devices by design. Ranger brake lathes replaced transmission / gears found on other brands. Brake rotors are very smooth. If you were turning a rotor on any lathe and drop a hammer on the floor next to the lathe you are turning, you would see a noticeable degradation of the cut right at the moment you dropped the hammer (of impact). Vibration causes frequencies, these frequencies get transferred to the finished cut. You won' t have this problem with the Ranger RL-8500 brake lathe because it does not use gears and transmissions. 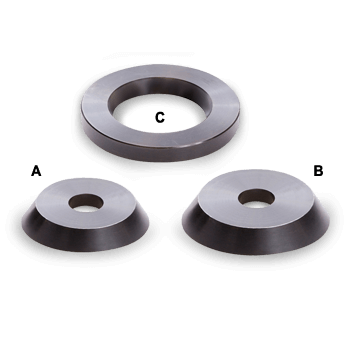 Ranger has completely eliminated multiple frequencies, eliminating any degradation on the machining finish. Surface roughness is usually the result of improper material properties, spindle rotational speed, tool feed rate, tool geometry, and relative tool-work vibration. Vibrations and noise from gears is eliminated also. The Ranger RL-8500 brake lathe offers more features, better performance, extra utility, best flexibility and additional productivity than you can imagine. It's the soundest investments for your business. 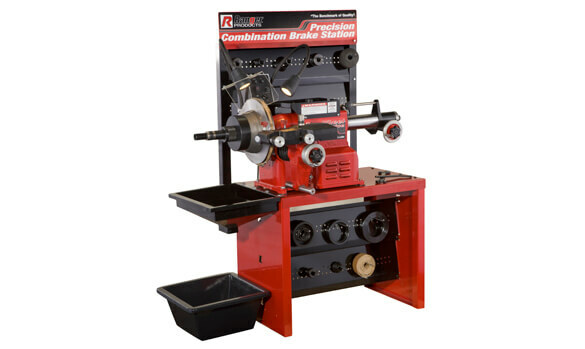 Ranger Brake Lathes include a complete adapter package, simple controls that minimize operator movement, a double-headed work lamp, a standard heavy-duty work bench, convenient quick-change tool-head design, safety shield, chip "catch" funnel and an adjustable cross feed stop. Ranger is value. Wrenchers Warehouse sell Ranger! Tooling package features Rangers Quick-Change Adapter Plus system eliminating the need for conventional bell clamps and cones. Tool package fits foreign and domestic car plus light truck hub less drums and rotors with 2-5/32” to 4” center-holes and composite rotors with center-holes 4” to 6 1/4”. Also included are: backing plates, tapered collets, centering cones, self-aligning spacer, the micro-dial twin tool cutter, boring bar, hubless adapters, bell clamp, step adapter, wrenches, drum silencer, universal silencer band, and safety shield. Stopping is a vehicles most important feature. Make sure you have a Ranger Brake Lathe to service your customers brakes. How "stable" are the Ranger Brake Lathes, you tell me! Click here. Browse and compare our full offering of Ranger Wheel Service Equipment!.